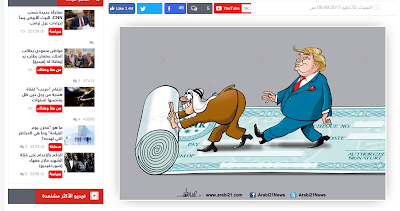 Trump would like to claim that all Arab and Muslim leaders he lectured in Riyadh, Saudi Arabia, are united to fight terrorism and confront Iran. The reality tells a different story. Just a day after he left, Egypt, UAE, Bahrain, and Saudi Arabia launched an unprecedented and coordinated media attack on one of their own: Qatar. The Saudi and Emirati owned satellite television station, Alarabiyya and Skynews-Arabic, reported that the Emir of Qatar issued statements defending Hamas and Hezbollah, refusing to confront Iran, and praising US protection of his country against countries that are known sponsors of terrorism (a reference to Saudi Arabia). The two channels aired extensive coverage of these unverified reports even after the government of Qatar refuted them and claimed that its news agencies’ websites and social media accounts were hacked. The governments of Egypt, UAE, Bahrain, and Saudi Arabia kept the pressure on Qatar, signaling that the crisis between them is deeper than a mere news report. In a coordinated action, they blocked 21 Qatari websites, including Aljazeera’s. Their main news outlets continued their attack on Qatar. These events show that Saudi Arabia is leading an alliance that is at war with itself. Representative of each of the countries that attended these so-called summits with Trump had no idea what to expect. Some asked if there were going to be a joint statement and they were told that there will be none. Yet, after all the delegates left, the Saudi rulers released a statement in the name of all the Arab and Muslim leaders. Many countries felt the need to release separate statements emphasizing the so-called Riyadh Statement does not represent their official position. Qatar is being signaled out because it is supposed to be, not only part of this fictitious anti-terror Islamic coalition, but member of the club of rich Arab nations— Gulf Cooperation Council GCC. That membership was supposed to force them to hold a united front against real and perceived enemies. The visit of Qatari foreign minister to Iraq, an ally of Iran, just days before Riyadh summits, must have angered the Saudi rulers. Trump wanted Muslim rulers to fight terrorism. He called on them to do so from Saudi Arabia, the nation that created and spread the creed of al-Qaeda and its derivatives: Wahhabi Salafism. The Saudi rulers and their allies want to shift the blame to Qatar, which is indeed a sponsor and supporter of Wahhabi Salafism too, but also supporter of the Muslim Brotherhood, which is seen as a threat to Egypt and UAE, especially. These developments reveal the weakness and inconsistencies from which the so-called “Islamic anti-terror alliance” suffers. It is an alliance made for propaganda not for real action. 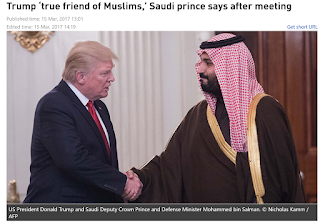 Trump, whose first executive order as president imposed a Muslim Ban, which was blocked by U.S. courts and opposed by civil society institutions, was declared a “true friend of Muslims.” That declaration was made by the Saudi Deputy Crown Prince, Mohammed Ibn Salman, who recently mocked an entire religious community, Shia Muslims who believe in Mahdi as a messiah (btw, Many Sunnis also believe in an Awaited Mahdi), for the tenets of their faith as a cause for his regime’s hostility towards Iran. It is extraordinary that a member of a ruling clan that espouses Wahhabism, which holds that the earth is flat, playing chess as haram (proscribed) and a number of other absurdities, declares that he will only normalize relations with a neighboring nation when it abandoned its religion. The Saudi kingdom is built on three pillars of supremacy: The supremacy of the Saud Clan, the supremacy of being Arab, and the supremacy of Wahhabi Salafism, all of which are canonized in the official name of the kingdom and the titles of its rulers: The Kingdom of Saudi Arabia (KSA), ruled by the Custodian of the Two Noble Sanctuaries, Salman, and his select princes, God’s Commanding Guardians [Awliya’ al-amr]. This arrangement allows the Saudi rulers to subjugate its people treating them as a flock [ra`iyya]–not citizens. The Saudi rulers further segment Saudi society into classes with varying rights and privileges: women are subordinate to men, non-Arabs are subordinate to Arabs (except European white men), non-Muslims are subordinate to Muslims, and non-Sunni Muslims are subordinate to Sunni Muslims, and poor persons are subordinate to rich persons. These values, principles, and practices guide their domestic and foreign policies. 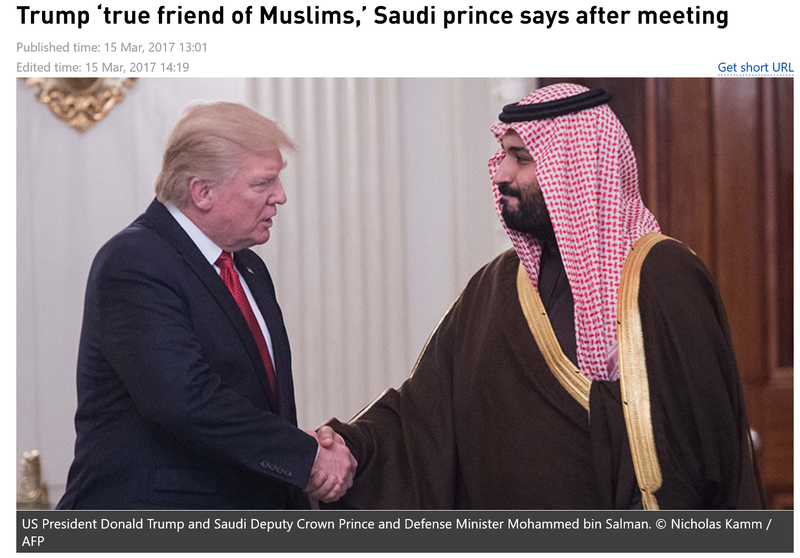 Ibn Salman’s characterization of Trump as a “true friend of Muslims” makes sense in such a context. In the mind of the Saudi rulers, Trump is the Commanding Guardian [Wali al-amr] over Muslim-Americans. As a rich white man, he is on the same level as members of the Saudi ruling family. He is, then, a true friend of Muslims—rich, Wahhabi Salafi Muslims that is. The Saudi rulers have subjugated the people of the Arabian Peninsula for more than seventy years. They used all resources, connections, and their control over religious sites to attempt to subjugate the rest of the Muslim people around the world. However, Muslim-Americans, especially Sunnis, should not tolerate the offensive paternalism of a misogynistic, supremacist, callous rulers. For Muslim-Americans, Trump is a public servant, not a Commanding Guardian over them. They don’t need rulers from thousands of miles away, to tell them who is a “true friend of Muslims and who is not. A regime that bombs children in Yemen and treats non-Saudi Muslims as inferior to Saudis lacks the moral standing to represent anyone but itself. In fact, the Saudi rulers stand guilty of fomenting sectarianism, hatred, and bigotry. Only an ignorant person would believe the Saudi rulers’ claim of leading the Muslim world and only a bigot will share their worldview. The Saudi rulers relish heads of governments with legitimacy deficit. When the first wave of protest popularly known as the Arab Spring pushed out the Tunisian authoritarian, Zine El Abidine Ben Ali, no other country in the world was willing to offer him a home. Saudi Arabia offered him a sanctuary and the rulers of the kingdom ignored repeated requests to extradite him to face charges in Tunisia. When Egyptians rose up against another authoritarian, Housni Mubarak, the Saudis offered to take him in, he refused, preferring to stay and die in Egypt. The Saudi rulers lashed out at the Obama administration for not doing enough to save their ally and “moderate” leader. Yemeni people rose up against another Saudi backed leader, Ali Abdullah Saleh. The Saudi rulers intervened and engineered a deal that transferred the presidency to then vice president Abdrabbuh Mansur Hadi, with the condition that he will be replaced by an elected president within two years. With the possibility of Saleh or some other figure winning the elections, an uncertain outcome for the Saudis, the elections never happened and the Saudis decided to keep Hadi as the only “legitimate” ruler of Yemen. The Houthis and their allies decided to overrun the capital Sanaa, forcing Hadi to resign and flee to Riyadh. The Saudi rulers launched a military campaign to reinstate his Hadi and his government. They are still working towards that goal. In Iraq, then Prime Minster Nouri al-Maliki was considered by the Saudi rulers as being too close to the Iranian government. They pressured their Iraqi allies to replace him. Instead, Maliki’s coalition won the 2014 elections and he was set to start a new term in office as Prime Minister. Saudi Arabia pressed harder, forcing him to step aside in favor of Haider al-Abadi. In Syria, when the peaceful protest tuned into an armed rebellion, the Saudi rulers immediately took the side of the rebels, including UN-designated terrorist organizations like Nusra and ISIL. The pattern is clear: only rulers accepted to the Saudi rulers are legitimate. That position is reflected in their unprecedented generosity with an American president with the lowest public approval rating since such a record was first recorded. Sounds weird? It should not; it makes perfect sense: a regime that lacks legitimacy naturally gravitates towards like-minded regimes. Birds of the same feather flock together. In the long run, this Saudi approach is a terrible strategy for leading a nation in a rapidly changing world. 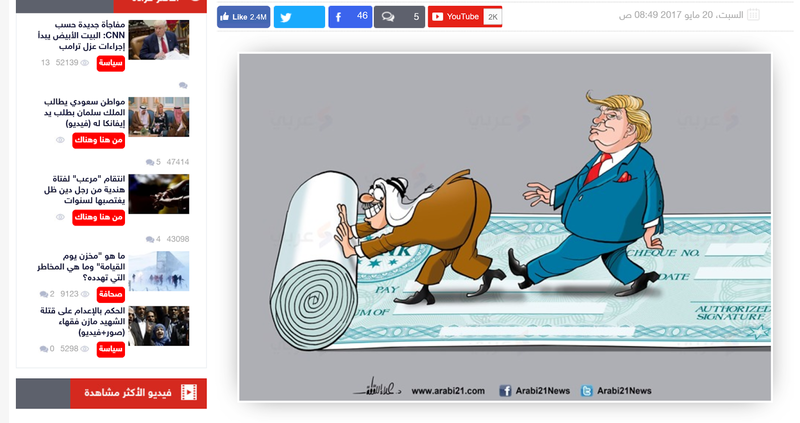 In return for the “honor” of being first stop for a US president, an honor perhaps no other country in the world wants to pursue, the Saudi rulers will have the US military and diplomatic protection that they did not lose in the first place. But they will have to pay for this sold-twice shield with money in the form of military hardware and services, investment in US “red states” economies, and propaganda for Trump as “Muslim’s Best Friend Forever”. 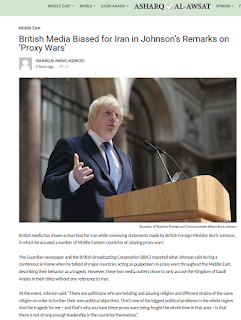 The UK’s Foreign Secretary Boris Johnson stated a fact almost universally known by now. He pointed out that Saudi Arabia is fomenting sectarian war in the region. Saudi officials were angered by the comments and Saudi media accused British media of having an Iranian bias when reporting his comments. 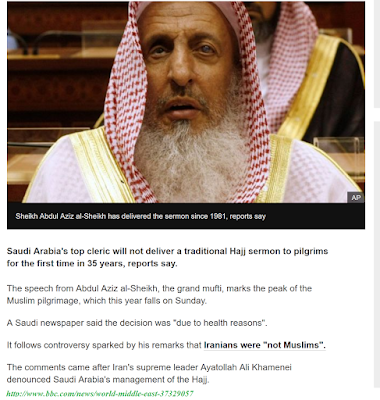 Saudi rulers’ unhappiness with UK media is not specific to this particular instance. They are threatened by the rise in news stories portraying the Saudi military campaign in Yemen in a negative light. BBC had several programs that put the blame for the horrific conditions of children in Yemen on Saudi Arabia. 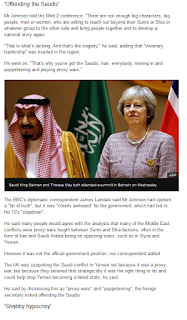 Moreover, UK media in general is highlighting the hypocrisy of UK government, which criticizes Saudi War in Yemen, but keeps selling weapons that enable the rulers of the kingdom to conduct its destructive war in Yemen. 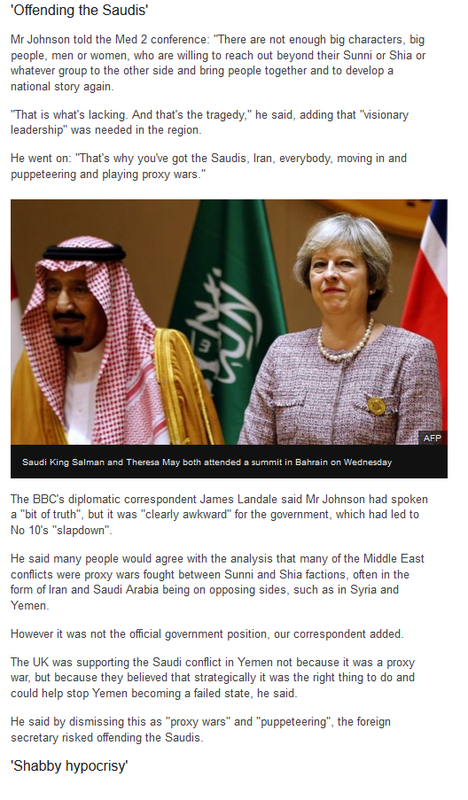 In its attempt to manage this crisis, especially that UK premiere was a guest during the GCC summit in Bahrain, Downing Street was forced to release a statement distancing itself from Johnson’s views. and supporting terrorist groups around the world. Outgoing U.S. president, Barack Obama made the case against Saudi Arabia in a 90-page long article summarizing his views in The Atlantic. Last summer, German intelligence officials also accused Saudi Arabia of building Islamic centers in the West that promote Wahhabism. The incoming U.S. administration will likely take a harsh stance against Saudi Arabian leaders as well. In short the Saudi rulers must reform their political and religious institutions to be able to live in peace with their neighbors or risk crippling isolation.